Keep your saddle Korrect this season! At this time of year your horse often changes shape, whether it be through weight fluctuations or muscle development as they get fitter and stronger in preparation for the season ahead. This can make saddle fitting a constant challenge, however First Thought Equine, manufacturers of the WOW saddle, have introduced the Korrector Air Saddle Pad which can help! Even when a saddle fits a horse well, over the course of a year, changes in diet or level of fitness will result in changes of muscle structure, and the shape of the horse’s back. Therefore a saddle that originally fitted well may no longer fit the horse. Many people find it difficult to get a saddle fitter to visit to re-flock or adjust the saddle, and need to resort to saddle pads to ‘take up’ the difference. Most saddle pads cannot be adjusted, and the majority assume that the saddle does not fit throughout its length. This is not normally the case, as most saddle fitting problems only occur at the front. Korrector has four air bags for adjustment and a foam sheet for shock absorbency. 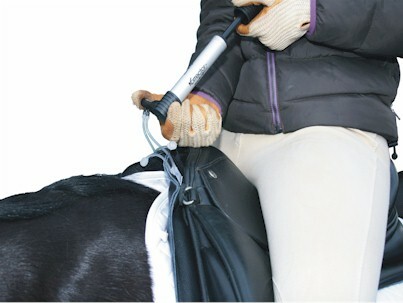 You only use those pairs of bags required to correct the saddle, so cutting down on unnecessary bulk under the saddle. Korrector can be used with four air bags to create a shock absorbing pad under the whole saddle panel. The bags can then be adjusted so there is more air in the front or back bags to balance the saddle front to back or even side to side. Korrector can also be used with just the two front air bags to create a front riser pad or just the two back airbags to create a back riser pad. As horses come back into work after a winter break, or simply build up or drop muscle due to the change in seasons, it can lead to saddle fitting issues. WOW have developed the Korrector, which has four air bags for adjustment and a foam sheet for shock absorbency. You only use those pairs of bags required to correct the saddle, so cutting down on unnecessary bulk under the saddle. 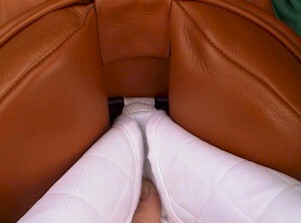 Korrector can be used with four air bags to create a shock absorbing pad under the whole saddle panel. The bags can then be adjusted so there is more air in the front or back bags to balance the saddle front to back or even side to side. Korrector can also be used with just the two front air bags to create a front riser pad or just the two back airbags to create a back riser pad. Korrectorhas been developed to help owners dealing with the ever-changing shape of their horse. For more information click here. It is a well known problem that horses change shape throughout their working lives, making it difficult to ensure that the saddle conforms to the shape of the horse’s back at all times. Even when a saddle fits a horse well, over the course of a year, changes in diet or level of fitness will result in changes of muscle structure, and the shape of the horse’s back. Therefore a saddle that originally fitted well may no longer fit the horse. Many people find it difficult to get a saddle fitter to visit to re-flock or adjust the saddle, and need to resort to saddle pads to ‘take up’ the difference. Korrector is the revolutionary new saddle pad which using air and foam technology, can be adjusted by the rider to give full day to day control of the fit of their saddle on one or more horses. 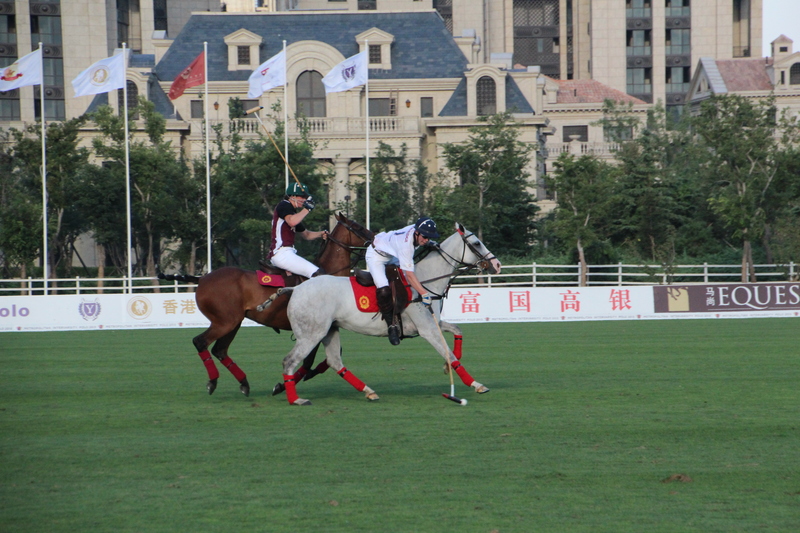 Once adjusted Korrector does not need to be altered unless the horse changes shape or you wish to use it with another saddle or on a different horse – adjustments take a couple of minutes and are done with the rider mounted. Korrector can be used with saddles that fit or with saddles that don’t fit because they are too wide or out of balance. Korrector has a unique Gullet Locking Plate (GLP), which prevents the saddle pad from being pulled taut across the horse’s spine. All cloths are cut for high withers and have front ties, so alleviating the pressure often caused by saddle pads and numnahs in these areas. GLP can be purchased separately. 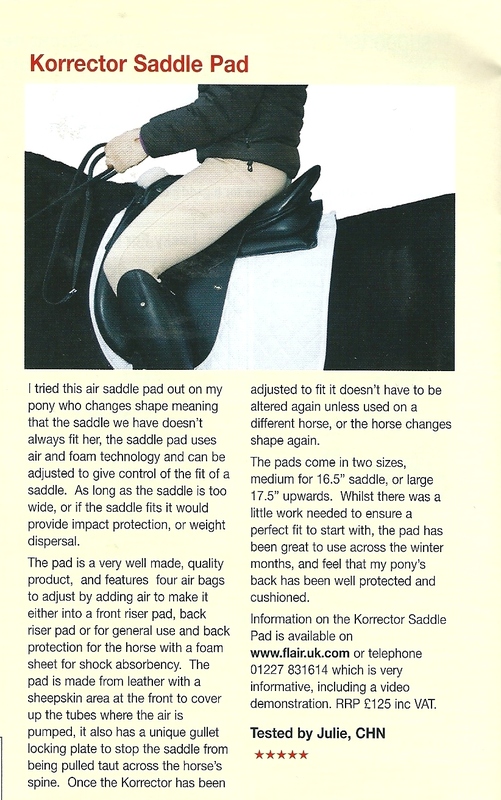 We were pleased to see the Korrector Saddle Pad being Tried and Tested in May’s edition of Central Horse News.